JPVAMC Small World is a NAEYC accredited not-for-profit Child Care Center located on the grounds of the Jamaica Plain Veterans Hospital. Founded in 1983, we have been providing child care for infants, toddlers, and pre-schoolers for over 30 years. Small World serves as an advocate for children, their families, and their teachers in community and society. We adhere to the NAEYC standards of excellence. We recognize all children have individual learning styles, strengths, and needs. 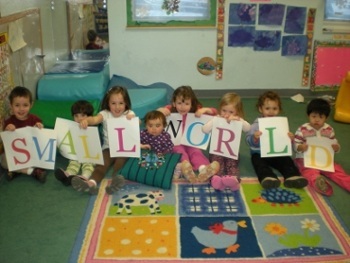 It is the philosophy of Small World Child Care Center that children are unique individuals who deserve a warm, secure environment that promotes a sense of joy, curiosity and discovery in learning. We encourage children to develop socially, intellectually, and creatively as they grow. We value an inclusive environment that respects the distinctive qualities of others and individuals aspect of themselves. We partner with parents to promote and enhance the child’s growth and development. Our hours are 7:00 a.m. to 6:00 p.m. Monday through Friday. The center is closed on federal holidays. We care for about 50 students, ranging from infants to preschoolers. All of our teachers have training in Early Childhood Education and/or Child Development and are exceptional at understanding the unique needs of children at all stages. Small World has a wonderful staff retention rate. The majority of staff have been	at Small World for 5-12 years.